Hey, it’s over 80 degrees in Seattle. Which means two things for me: rotating in a lemon cucumber salad to my ovenless/stoveless summer cooking repertoire and complaining about the heat. See, when the thermometer breaks 79, many folks in Seattle (me included) treat this event like we’ve got triple digit heat. I can’t believe I lived so long in Chicago, enduring 90+ degree days with soul-crushing 100% humidity. Egad, I’ve become soft. But enough with the whining. When I doth protest too much, it’s time to focus my attention on putting together a simple lemon cucumber salad. I don’t know what it is about this particular permutation of cucumber that I like so much. Maybe it’s just the way they look. I slice them up along with some sweet Walla Walla onions, toss in a simple vinaigrette, and let it sit for a bit in the refrigerator. Perfect on its own or atop some grilled salmon. And don’t forget to stick the wine in the fridge. 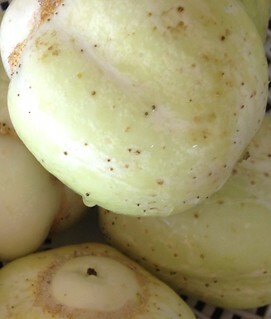 About the time your wine is chilled, your lemon cucumber salad will be at a similarly refreshing temperature. What wine? 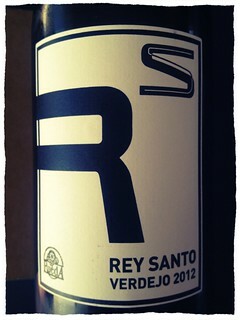 I’ve been enamored with this Spanish white wine made from the Verdejo grape, the 2012 Rey Santo. It’s not lemony but is certainly grapefruit-y and zesty. 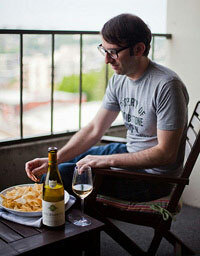 Verdejo reminds me of Sauvignon Blanc’s more laid back, less hyper cousin. Plays very well with vegetables and seafood.